Th-INK-ing of You: Encouragement the Moxie Fab way! Patti's challenge is "A Way with Words". Create a card or project that will compliment, encourage, or cheer someone in need of uplifting. The top card is made with Layers of Color Granny's Jewelry clear art stamp set, stamped in Stazon Silver, and Gina K Fanciful Tags (by Nina Brackett) for the sentiment, heat embossed in white. 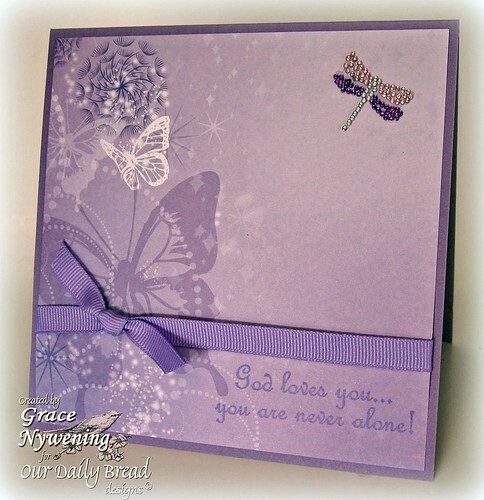 The second card is made with Our Daily Bread designs "God Loves You" set, stamped in Lavender Lace (SU!). Both cards are on a base of EK Success Craftstock (Purple Heliotype) and use designer paper by Kaisercraft (Airy Fairy). The ribbon is from my stash, as is all the bling. Both cards were made in a snap... REALLY CAS for me, but I do like them and know I have many uses for Praying for you cards! We want to thank them for their continued support and generosity! Please visit their store for the widest selection of stamps around! For the full devotional and challenge details please visit the Stampin Sisters in Christ Challenge. Thanks for visiting and I can't wait to see what you come up with! Oh how gorgeous Grace!! 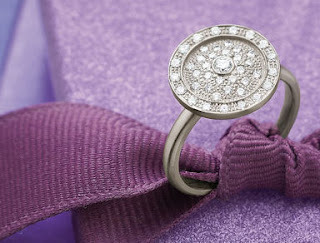 I love these with the beautiful lavender and your bling and ribbon. Simply beautiful!!! I hope you are enjoying your time with Christy! Oh my this is so beautiful! Those colors are wonderful and the soft look of it is soothing. Great card Grace. Have a wonderful week. Both of these are gorgeous and love the bling on them. I know if I received one of these it would brighten my day. Really gorgeous. Thank you for joining us at Digi Doodle Shop's Best. Grace these cards are beautiful and would be a true encouragement to anyone who received them. 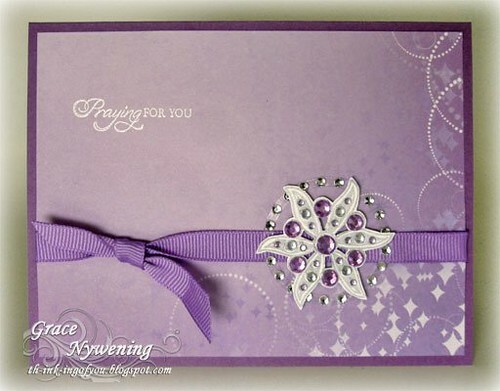 Beautiful creation - love the soft colours and everything about this card. Beautiful takes on the trigger Grace!! Love the sparkle and color! Gorgeous! Thanks for joining us at Digi Doodle Shops Best. Simple yet elegant. Well done!! Thanks so much for playing along with us at Craft Your Passion, in our "anything goes" challenge. Grace what a beautiful color choice. I like how the flower puff in the DP on the second card mimics the round shape of the ring in the inspiration photo. Lovely just lovely. Oh my, Grace, two gorgeous creations! Such elegance! They are both soooo gorgeous! Really elegant! Love the colors! Both of these are just beautiful! Love the jewels on the top one, and the paper and dragonfly on the second one is beautiful. I am not even a ring person, but that inspiration piece is fantastic! Just beautiful! Thanks for joining us at Fresh Brewed Designs this week. Oh Grace your talent is just amazing!! I love the colors and your embellishments are perfect!! Stunning cards.Thank you ever so much for joining us at Fresh brewed designs this week! Such a very pretty card! Thank you for playing along with us this week at Digi Doodle Shop's Best! It just doesn't get more lovely than this. Beautiful creation! alright! i am your fan! Seriously woman! YOU ARE TALENTED!!! love your work here! I am so so so glad i found you thru your candy!